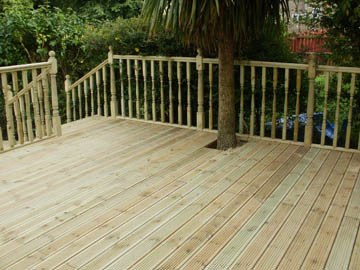 Decking can enhance the appearance of any garden creating a contrasting patio area. 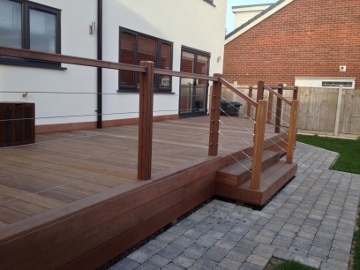 Proper instalation is the key to ensuring that your decking will stand the test of time. MJS have carried out many repairs to decks due to bad installation. The typical causes are incorrectly spaced or inadequate deck joists allowing the deck to bow and hold water. 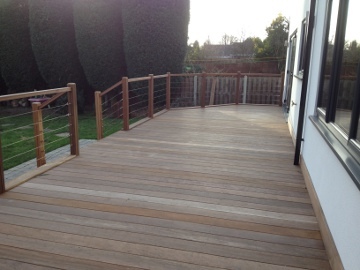 The use of cheap poor quality deck boards, soil in contact with the subframe and inadequate spacing between deck boards to allow for expansion and shrinkage plus many more.Tanlaised pine decking is the most common type of decking that we fit. It is worth knowing that a lot of landscapers use 28mm thick deck boards which are the thinnest and cheapest available. We use heavy duty 32mm boards or even 38mm for a slightly higher cost. 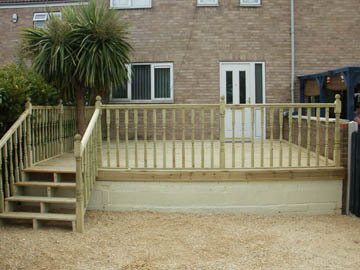 The next image to the shows the beauty of untreated yellow balau decking. If left untreated the timber will fade to a more silver colour over time but is still naturally resistant to moisture and moss.Alternatively hardwood deck boards can be treated with a range of protective oils that enhance the colours of the wood and offer furthur protection form the elements.Yellow Balau is probably the most popular choice for hardwood decking in the UK.The second image shows the face of the deck and steps which were incorporated to provide access to the lower garden.This project also featured a balustrade system consisting of hardwood yellow balau newel posts, matching hand rail and a modern cotemporary wire infill.Furthur pictures of this project can be seen on our decking portfolio.